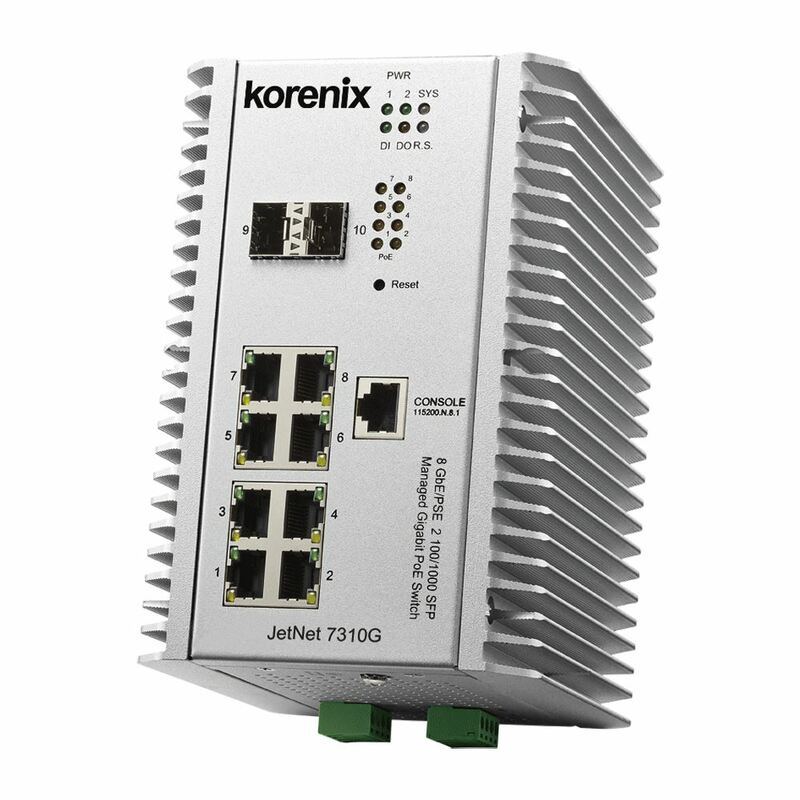 Korenix (Beijer Electronics Group) Industrial L3 Managed PoE Switch- JetNet 7310G. It is specially designed for IP Surveillance market with the NEMA-TS2 characteristics and EN50121-4 compliance. Korenix JetNet 7310G is equipped with 8 Gigabit Ethernet RJ-45 ports and 2 Gigabit Ethernet SFP ports. It is compliant with IEEE 802.3at/af standards with 1-event and 2-event behaviors for PD classification. The system maximum power forwarding is up to 240W at the 75℃ operating environment and the power capability of each PoE port is up to 35W. It can, therefore, perform well on power feeding to devices with high power consumption such as IP cameras. The Korenix JetNet 7310G supports Layer 3 Network Routing Protocols include Static/Dynamic Routing, VLAN Routing, and Multicast Routing; with the various routing features, the data streams will be routed in an efficient way and accelerate data streams as well. It also carries Layer 2 Network Performance like IEEE802.1Q VLAN, Trunk, Packet Filtering, DHCP Server/Client, Traffic Prioritize, and Rate Control; users can optimize their Network by these features. Contact Korenix at sales@korenix.com to get further information.